'Like father, like son' as they say in Ypres, except that the Albion Hotel is run by two ladies: Christiane and her daughter Ruth. Both have been welcoming visitors of Ypres since 2000, when they started the hotel. The combination of hospitality, first class accommodation and cosiness was almost instantly a huge success amongst guests. 'I think our visitors keep coming back because they enjoy the relaxed atmosphere after a day of walking and visiting the region', says Christiane. 'If people tell us that when they enter the Albion Hotel, it is like coming home again', Ruth and I feel very proud. 'Because it is exactly that feeling that we want to share with our guests'. The Albion Hotel is ideally located to discover the 'Westhoek'. Interested ? Click here. In 2019, the Albion Hotel belongs again to the top 20 of Belgian Hotels with the best service. Thanks to all our guests for this acknowledgement. Nowhere else you will find a memory so vivid about this historic event as in the heart of the poppy fields of Flanders. 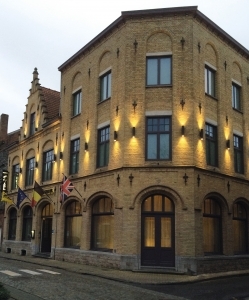 The Albion Hotel is the perfect location in Ypres for visiting historic sites like the Menin Gate, the trenches and the museum In Flanders Fields evoking the several Ypres battles which took place in World War 1. Discover the authenticity of a historically restaured building dating from before World War 1. Your hosts, Christiane and her daughter Ruth, will ensure that your stay in this Ypres hotel will be an unqiue experience never to forget. Enjoy the food and chocolate shops at only walking distance from the Albion Hotel. Discover the variety of trendy boutiques, charming restaurants and must-see places of Ypres. You will feel immediately at home in this small but charming town. At only half an hour from the coast, Ypres is also very near to UNESCO world heritage locations like beautiful medieval Bruges, the magnificent historic center of Ghent and metropolitan Lille (France). The Albion Hotel in Ypres (Ieper): stay in one of the finest hotels of Ypres. The hotel is centrally located close to the Menin gate and the In Flanders Fields museum.